In Hel Achau 46 (August 1995) mention was made (pp14-17) of Penley's "separation from Ellesmere" during the Commonwealth period. 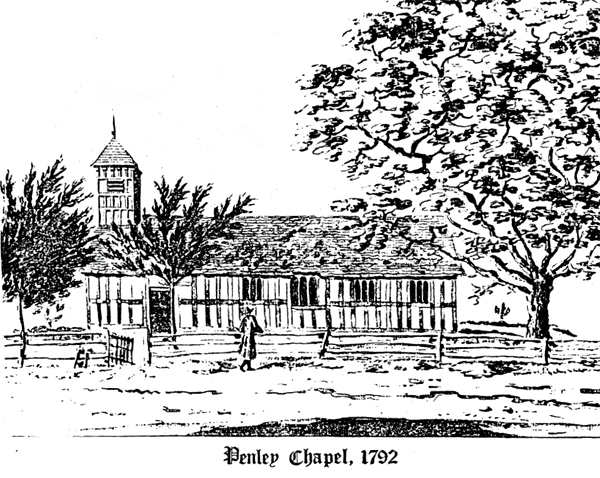 From early 1657 to mid-1661 Penley enjoyed the status of an independent parish under the charge of Rev. John Broster, who kept his own register until evicted from the living. As noted, Broster took the parish register book with him, knowledge of its existence and survival only coming to light in 1995. While one must assume that sometime after the Restoration Penley reverted once more to chapelry status with a Perpetual Curate in charge, there is further tantalising evidence to show that its newly gained independence was not yielded without a struggle. The testimony or data is of the slightest, a solitary Bishop's Transcript in Lichfield JRO for 1663-4, a strip of paper measuring 117 x 146mm folded. This fragment lies outside the main run of Penley BTs which begin in 1752, the same year as Penley's earliest surviving parish register was begun by Rev. Richard Langford. That Penley church is referred to as a 'Chapell' might be construed as reversion to parochial chapelry status. But until the present church was built in 1900 and dedicated to St. Mary Magdalene, successive churches at Penley (a) had no dedication, and (b) were referred to popularly and officially as 'chapels'. The chapel element is found In relatively modern place/field-names e.g. Near and Further Chapel Fields (east of the church but lost to the former American/Polish Military Hospital). Again, across the road from the church gates stood (very conveniently) the Butcher's Arms (1820), by 1841 Chapel House Inn, moving up market in 1871 to the Gredington Arms (that is, those of Lord Kenyon), and delicensed in 1887 as 'Chapel House' (a farm and shop). The name of the immediate post-Restoration incumbent of Penley is not known unless it was George Armstrong, documented as curate at least 1682-95. He died shortly afterwards. There is something mysterious about this reverend gentleman. On 31 January 1685 Ellesmere parish register notes the excommunication of twenty individuals and one George Armstrong, "curate of Penley denounced and suspended the same day". No reasons are given, although there are other excommunication lists for 1667, 1673 (two) and 1682 for, variously, "not frequenting the parish Church" or "for keeping conventicles" or "for papish recusants". Conventicles were clandestine religious meetings, especially in the history of Nonconformity and Dissent. The phrase could apply equally to buildings used for such purposes. Was George Armstrong, if indeed he was then the incumbent of Penley, touched with some Presbyterian or nonconformist spirit? If his tenure at Penley goes back to the Restoration, was he battling to keep Penley a separate parish. Armstrong married a Hanmer lass in 1694,' but must have died shortly afterwards, as his widow was buried at Hanmer in 1704. But strangely, on the evidence of the Hanmer registers, Armstrong himself was not buried in that village. If he was not still excluded from the sacraments of the church he was probably buried at Ellesmere. Unfortunately the Ellesmere burial register and STs for 1678/1692-1713 are missing, indicative perhaps of the rather shambolic situation pertaining in the mother parish over that period. From the BT transcribed above several assumptions may be drawn. Firstly, from the phrasing of the rubric that this surviving scrap of paper is part of an on-going series of returns. Secondly that the BTs either. side have not survived. Thirdly, if the terminus a quo is as given, 20 April 1663, the last two entries must date from April 1664, otherwise the rubric is meaningless and misleading. Fourthly, that an incumbent of Penley is making annual returns, April to April or Easter to Easter. Fifthly, that for this particular year there have been no burials or marriages. This is nothing abnormal, and there are no corresponding entries in the Ellesmere registers. In the light of the above a new separate general register was being kept for Penley - otherwise why should the BT be headed "a true copy of the registration of all christenings, weddings and burials"? This in turn points to the church at Penley continuing to enjoy a status, and exercise a function, somewhat removed from that of a normal chapel of ease. In the Ellesmere registers entries relating to Penley people are generally qualified assuch, although it must be painted out that there is no cast iron guarantee that they were always so differentiated. But the first baptism specified as 'of Penley' appears in the Ellesmere register on 3 October 1669, then no further 'designated' entries until until 1674. The first 'Penley' marriage (which, perversely, actually took place at Penley) is entered in September 1679. There is a single 'Penley' burial in 1554, followed by a huge gap to March 1667 when the deceased of Penley once more become indisputably recognisable in the registers of the mother church. Apart from an inclination for Ellesmere vicars to die in the December, the list shows five incumbents in 23 years, with possibly several years in which there was a vacancy. After 1670 a 15-year gap in which there appears to have been no vicar at all at Ellesmere until 1685, when Rev. Joseph Ottiwell was inducted. This was the period, not only of Penley's 'independence', but also that of Ellesmere's other two chapelries, Dudleston and Cockshutt. For example, in January 1647 the £2,000 fine payable by Edward Kynaston of Oteley was reduced to £1,500 on making provision for £50 "to the Chapel of Dudleston for ever". Cockshutt, too, became "parochial with considerable augmentation", and had, as its first Presbyterian minister, one Francis Keeling, ordained at the Whitchurch Presbytry in 1657. It may be no coincidence that the excommunication of George Armstrong (1685) coincides with the advent of Joseph Ottiwell as Vicar of Ellesmere, someone who would hold that position down for sixteen years! Possibly it is during his incumbency that the wayward daughter churches are made once more to toe the pastoral line by the mother church. Finally, in answer to many queries, a note on the provenance of the illustration of Penley Church that accompanied my first article. half-timbered building, very much like Melverley Church, was drawn in 1792 by the Rev. Edward Williams, then perpetual curate of Uffington and Battlefield, Shrewsbury. A gifted draughtsman and amateur antiquarian he made sketches of Mansions of the Nobility and Gentry in Shropshire and over 300 drawings. of Churches, Parochial Chapels, Monastic remains, Castles, Monuments, Tablets &c., of which Penley is water-colour No.86 in Vol.3 (SRO 6001/372). Were it not for the fact that Penley was in the diocese of Lichfield and a parochial chapelry of Ellesmere, the drawing probably would not have been made at all, being geographically in Flintshire! "Penley has its history. It is one of the few Welsh parishes in an English diocese, and the only one in the diocese of Lichfield. It had its Church probably as early as the 15th century, and the building which stood prior to the 1794 church was, perhaps, better than the the one which took its place. The old black and white churches were often substantially built, and had that at Penley been allowed to remain it might have avoided the erection of a new building now, and have been an ornament to the whole district."